1. Design features of stainless steel 2 piece ball valve , 2000 wog. Stainless steel 2 piece ball valve, 2000 wog, floating type. Design features: floating type, reduced port, blow-out proof stem, pressure venting hole in ball slot, BSP/ BSPT/ NPT threads, 2 piece split body, 2000 WOG. Design standards: Wall thickness to ASME B16.34; pipe thread to ASME B1.20.1, BS 21, DIN 2999/259, ISO 228/1, JIS B 0203, ISO 7/1; Face to face: ASME B16.34; Inspected & tested to API 598, MSS SP 110, EN 12266. 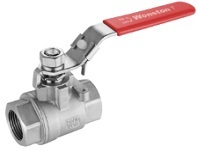 See more specifications of stainless steel ball valves. 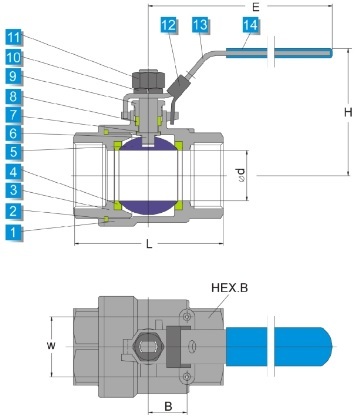 Technical drawing of stainless steel 2 piece ball valve, 2000 wog, floating type. The material selection of stainless steel 2 piece ball valve, 2000 WOG, double female threaded ends, floating type. Custom-materials are available upon request. The dimensional specifications of stainless steel 2 piece ball valve 2000 WOG, double female threaded ends(NPT/BSP/BSPT).